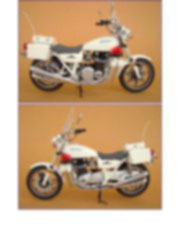 In 1976 Kawasaki launched the model Z750, a smaller sister to the Z900, adapted to the requirements of the Japanese market. 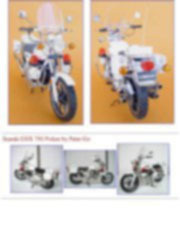 To my knowledge, the Z900 was an improved copy of the Honda CB750Four and, as it was common to Japanese manufacturers, each new model included several versions in order to cover the requirements of the Japanese police. 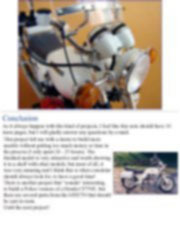 This model was inspired in a small picture from the '70 decades. 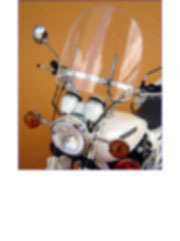 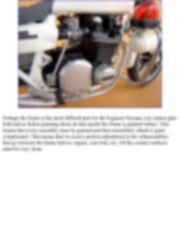 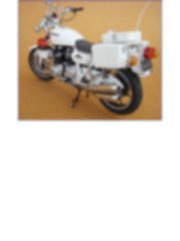 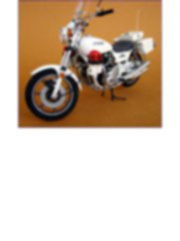 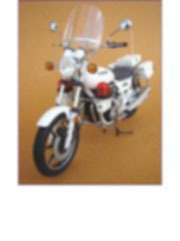 the picture was showing a Z750 model, perhaps a 1978 version, for the police, with the color and characteristics of the Japanese Police. 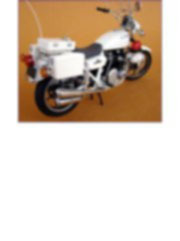 In 1976 Kawasaki launched the model Z750, a smaller sister to the Z900, adapted to the requirements of the Japanese market. 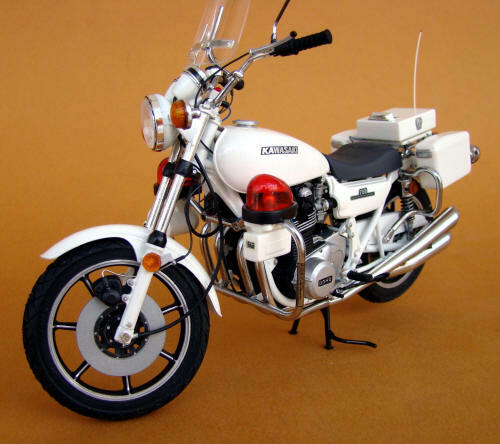 To my knowledge, the Z900 was an improved copy of the Honda CB750Four and, as it was common to Japanese manufacturers, each new model included several versions in order to cover the requirements of the Japanese police. 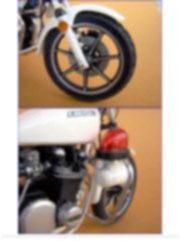 This model was inspired in a small picture from the '70 decades. 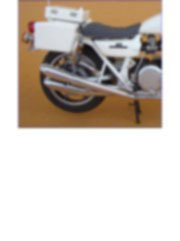 the picture was showing a Z750 model, perhaps a 1978 version, for the police, with the color and characteristics of the Japanese Police. 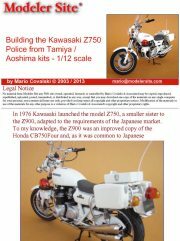 It probably was a publicity brochure and the model never hit the streets, but that increased my interest in the Aoshima ZII kit; in fact, I bought this kit a few years ago but I wasn't too convinced due to its low quality (I must make clear that the kit is very old, probably from the 80's or older). 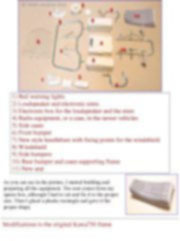 My objective with this note is to take the reader through the work performed in order to achieve a project with these characteristics. 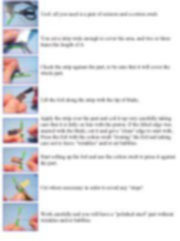 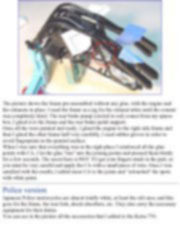 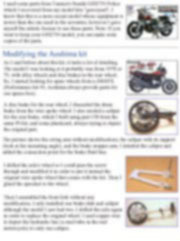 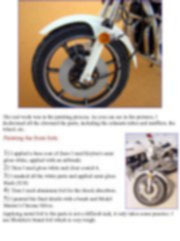 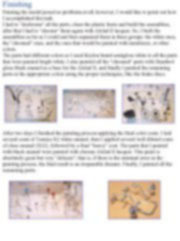 Leaving aside my personal enthusiasm for this model, I truly believe that this note will be very useful to motorcycle modelers. 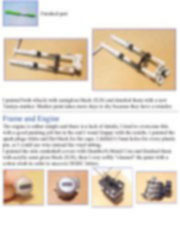 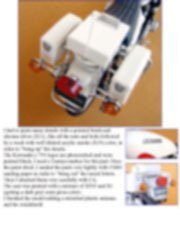 I want them to try other models, different to the new Tamiya kits, which are devoted to competition models. 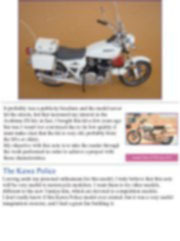 I don't really know if this Kawa Police model ever existed, but it was a very useful imagination exercise, and I had a great fun building it. 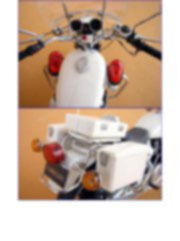 I used come parts from Tamiya's Suzuki GSX750 Police which I recovered from my model kits "graveyard", I know that this is a more recent model whose equipment is newer than the one used in the seventies, however I gave myself the artistic license to use these parts. 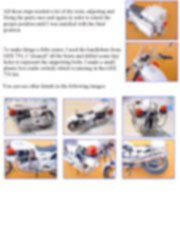 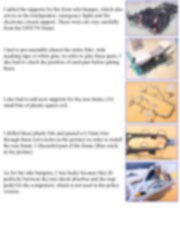 Note: If you want to keep your GSX750 model, you can make resin copies of the parts.